Nine of Wands suggests strength of vision, perception and intuition balanced mentally, emotionally, spiritually and physically – the true strength from within. You have learned to deal with your problems and the compromises they demand and you have developed wisdom and discipline from your experiences. You are on the right path – continue on this way – hear what others have to say and do not be obstinent. Hold on to what you believe and trust that you have the knowledge, wisdom and strength to see it through. Know and respect yourself, be true to yourself and value yourself by walking your own path. Defend your spirit without compromising – be honest. Preserve your spirit – keep mentally, physically and emotionally fit and your spirit will naturally guide you. Preparation and strength will be necessary for any opposition that can arise now – but you will be victorious! You have tremendous vitality, attractiveness and charm to both sexes. Face your greatest fears with the gift of this strength of purpose – turn away from that which is not right for you and aspire to your higher purpose. Meet your future with an unshakable stance. As you protect and support others who are in need – you will find spiritual strength in facing your own fears. Complete this spiritual or creative task – open your mind to life. Look at all the possibilities and to release the energy that is being contained within yourself. The mental and spiritual are in productive working agreement – there is a solid philosophy in place as you begin to know spiritual truths at the intellectual level. Your mind has established a level of truth for “self” which echoes universal truth. When someone approaches you, they can not help but sense the degree to which your center is aligned with the center of all things. This gives you an air of authority and people tend to submit to you rather than to challenge you. Good communication between your spiritual and mental planes. Knowing God intellectually, the mark of a theologian – the impact of grace on a well-trained mind. On target with the Karmic Contract. Knowledge is the path leading to enlightenment. A firm foundation and backup resources at all four levels – mentally, physically, emotionally and spiritually. Hidden resources are available to you – even some which are not known to you – you may have much more depth than you are aware of. True determination through identification with your beliefs – both spiritual and intellectual. Next to Sun: Personal or business interests in vacation areas or properties. 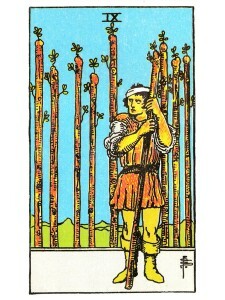 Next to Ten of Wands: Negotiations regarding real estate, building, rental or purchases. Next to Magician: Business inquiry regarding books and metaphysical interests. In the first position: The integration of spirituality into all of your lower levels is not so much a requirement at this point as it is simply a matter of fact. Spiritual exercise and ritual is for you a way of life. Spiritual progress at this point is very much the summation, the cap of the progress at the physical, emotional and mental levels. In the second position: These spiritual wands will provide more than enough timber for the spokes of your chariot, taking you everywhere you need to go in good time. Your foundation is most firm. In the third position: The spiritual system which you have worked to understand and bring on line in your life, perhaps even the community of like – minded souls, is at hand. Your position is most secure as you need only bear witness to your beliefs and others will accept and follow. In the fourth position: The integration of spirituality into all of your lower levels is not so much a requirement at this point as it is simply a matter of fact. Spiritual exercise and ritual is for you a way of life. Spiritual progress at this point is very much the summation, the cap of the progress at the physical, emotional and mental levels. In the fifth position: It must be an exciting time for you, to have reached the level of assurance that is yours for the keeping. But the excitement is tempered by awe. In the sixth position: If a major spiritual breakthrough has come to you or to someone near you, you know the profound effect it has on others. The moment of enlightenment throws a wide beam of light hitting all nearby. And while understanding may not come with the wash of light, a warm glow of well-being is experienced and everyone, not just the central character is affected. In the seventh position: The major mental test here is in maintaining your momentum on the path. You have achieved so much already and are in great demand to share and to teach what you have experienced first hand, that it is all too easy to stop and bask in the glory of your present position. In the eighth position: It may be time for you to deliver an important message, to bring your spiritual expertise on line for effect in the Physical Plane. The delivery of the “I Have A Dream” speech of Martin Luther King, Jr. on the mall in Washington, D.C. was such a message on a grand scale. In the ninth position: The heart is greatly pleased because it too like the mind, is privy to so much more and is filling with universal spirit. In the tenth position: Here is the impact of grace on a well – trained mind. Any difficulties you might have had functioning well at this level of heightened spirituality will not accrue at this time for there are things for you to do. You will be very much the guardian angel to the lessons of others in the near future, not later than this time next year. To be a guardian angel to others …. does that mean while being alive? Sasha, the Wands represent your communication with your higher spirits. We do not forget our past, the choice to forgive the injustices in your past – is basically the choice to release the need to “judge” it – knowing that all of the experiences in your past, have played a roll in the “who you are” today – your strength, determination, ability to love, ability to forgive, etc. Do you think any of this may be key? Thank you for this very uplifting, healing interpretation. It is beautiful and full of loving insight. You inspire me as a reader—keep it coming! This card has been a recurring entity in my life for seven years and your take on it is so reinforcing after seeing many negative interpretations. I really love your tarot meanings and the richness you bring to the cards.